Here's the popular, easy-to-use ESD-safe Pen-Vac® vacuum handling tool that features a durable, yet lightweight body and ships out with high-quality and high-temp, ESD-safe silicon vacuum cups for lifting small parts and components. 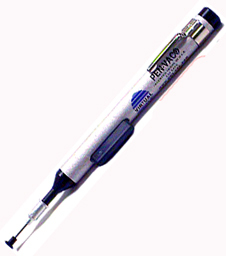 Vacuum from the Pen-Vac® is generated by simply pressing and releasing the vacuum release button. Pen-Vac® and Six Suction Tips. 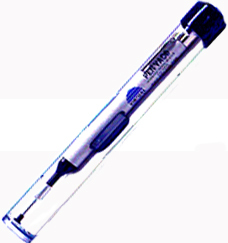 Pen-Vac® and Ten Suction Tips. ©1996 - 2011, 2012, 2013, 2014 Ameritronics®. All rights reserved. The information and all images you receive online from Ameritronics® is protected by the copyright laws of the United States. The copyright laws prohibit any copying, redistributing, retransmitting, or repurposing of any copyright-protected material. Ameritronics® is the registered trademark property of JTI, Inc. "Zephyrtronics" and "Zephlux" and "ZeroLead" and "Zero Balling" and "Zero Residue" and "Post Cooling" and "PostCooler" and "AirBath" and "Quatro" and "Full Metal Jacket" are the protected trademark property of JTI, Inc.